I just wasn’t feeling very productive this weekend. Perhaps the gloomy cloudy sky was the problem. Or maybe it was the lack of sleep caused by waiting up for my son who was out late 3 nights in a row. It may have been because I was worrying because my daughter is having problems with her thyroid. It could also be because I am not sure where the money we owe the IRS is going to come from. Probably a combination of all these things. 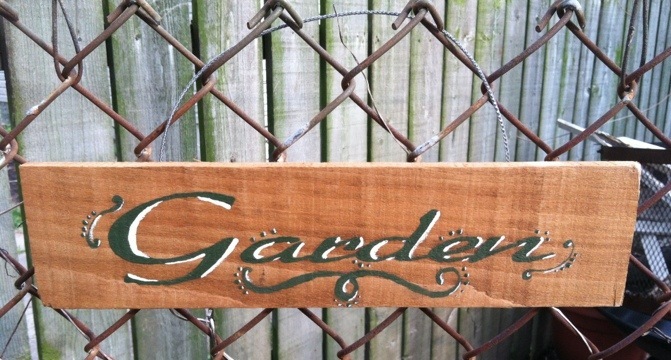 Usually a quick project can cheer me up so I made a little sign for my garden gate. I cut a piece of pallet wood and sanded it a little so I wouldn’t get a splinter. I was hoping to use my blender pen image transfer method and be done. I used Word Art in MS Word for my lettering and flipped it horizontal. I don’t have a laser printer so I had to go to the Library to use their copier to copy the design I printed on my inkjet printer. 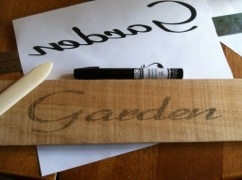 I used my blender pen method (directions here) to transfer the word to my sign. I wanted it to be darker so I decided to paint over over the letters with acrylic paint. I added a couple of swirls and some white highlights. Then I stained and sealed the whole thing. Stapled a wire to the back as a hanger and hung it on my garden gate. I still wasn’t feeling better. While hanging my sign I noticed all the weeds growing so I pulled on my gloves and started pulling weeds. There were a ton of weeds and for some reason a bunch of mysterious little trees. I pulled and pulled and felt my mood lift a little. While I was working my husband was cooking a delicious dinner and he had invited some friends over to help cheer me up. Our family and friends sat down to a wonderful dinner together and my mood lifted a little more. So this post really isn’t about a little sign I made…it is about not letting things get you down, and when they do using all your resources to pull yourself up. None of my problems are gone and when they are something else will probably come up. But I will keep working on doing what I can to correct the problems and keep myself going! Inspirational – What a great message ! !